James Marshall “Jimi” Hendrix (born Johnny Allen Hendrix) was an American rock guitarist, singer, and songwriter who The Rock and Roll Hall of Fame describes him as “arguably the greatest instrumentalist in the history of rock music”. Although his mainstream career spanned only four years, he is widely regarded as one of the most influential electric guitarists in the history of popular music, and one of the most celebrated musicians of the 20th century.Hendrix was inspired musically by American rock and roll and electric blues. He favored over-driven amplifiers with high volume and gain, and was instrumental in utilizing the previously undesirable sounds caused by guitar amplifier feedback. He helped to popularize the use of a wah-wah pedal in mainstream rock, and was the first artist to use stereophonic phasing effects in music recordings. His group, The Jimi Hendrix Experience, was inducted into the Rock and Roll Hall of Fame in 1992 and the UK Music Hall of Fame in 2005. 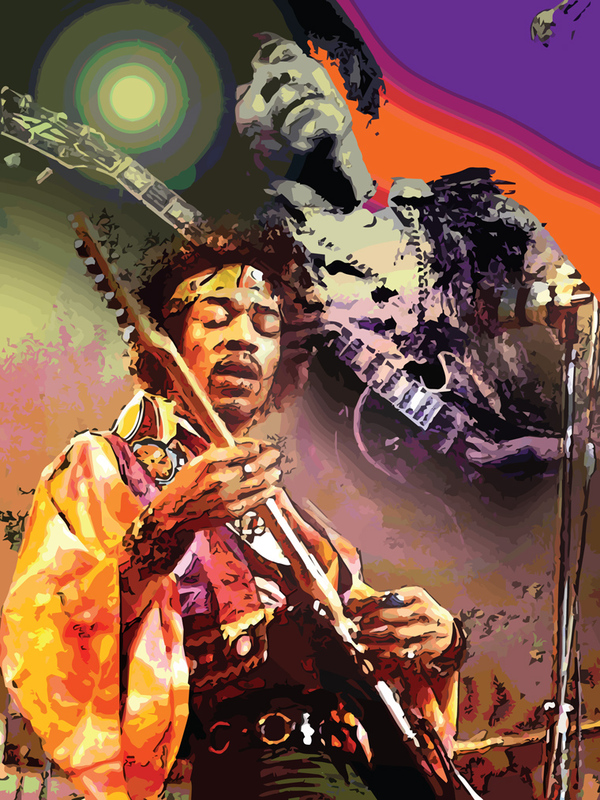 Rolling Stone ranked the band's three studio albums, Are You Experienced, Axis: Bold as Love, and Electric Ladyland, among the 100 greatest albums of all time, and they ranked Hendrix as the greatest guitarist and the sixth greatest artist of all time. Lounge area of restaurant with multiple metal prints.